A place to create new memories. A place to grow in your interests and career pursuits. 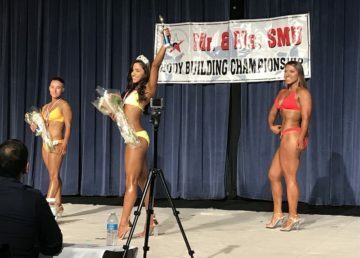 Just ask SMU sophomore Kelsey Barnard. 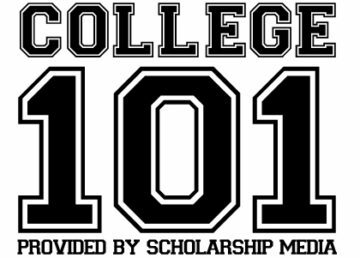 Barnard was looking forward to college to since her senior year of high school. She wanted to pursue her high school interests on a grander scale. She did not, however, expect to continue all her high school habits. Barnard started using e-cigarettes at 18 with the help of her boyfriend who had already been smoking for a few years. Her habit was contained to taking occasional hits off his JUUL when they were together. Sometimes the habit extended to parties they attended together. During her freshman year of college, Barnard’s boyfriend bought her a JUUL for her birthday. Consequently, the gift sparked more frequent use of the cigarette substitute. “Pretty much whenever I’m home, I’ll have it in my desk and will sneak a hit from it when I’m studying, or when I’m stressed out, or when I’m bored,” Barnard said. What started as a causal pattern to appear cool and stay current with social trends, soon became, in Barnard’s eyes, a crutch. This is a common pattern. Young adults across the country are becoming dependent on the playful-trend-turned-addiction. For students like Barnard, the use of e-cigarettes foreshadows a larger issue: getting hooked on a product originally intended to help combat addiction. E-cigarettes cartridges vary between brands but generally are a mixture of nicotine, glycerin, water, propylene glycol, and sometimes a flavoring can be added. Typically, the e-liquid contains 95 percent propylene glycol and glycerin. Popular companies such as JUUL, Blu, and Suorin have been upfront with their product’s intended purpose of helping adults quit smoking cigarettes. JUUL states that its products “are for adult smokers, not for youth or non-smokers.” Despite this disclaimer, there has been a dramatic rise in the number of young adults using JUULs and other e-cigarettes over the last decade. 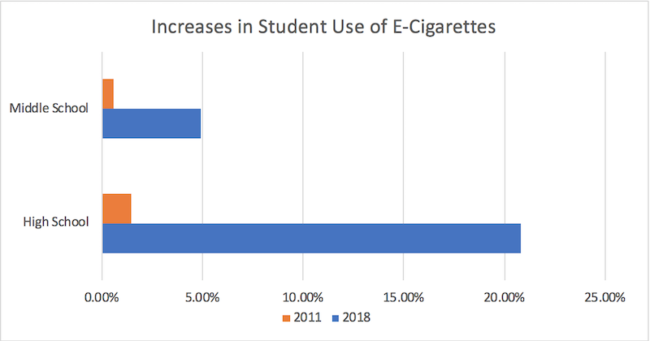 Data from the Center for Disease Control and Prevention shows current e-cigarette usage grew from 1.5 percent of the American high school student population in 2011 to 20.8 percent as of this year. That means approximately 1 out of every 5 American high school students currently use an e-cigarette. Middle school age students also reportedly showed an increase. In 2011, 0.6 percent of middle schoolers surveyed said they used e-cigarettes. As of 2018, that number has grown to 4.9 percent of all American middle schoolers, or 1 in every 20 students. These numbers primarily represent minors between the ages of 12 and 17, starting their addiction even earlier than Barnard did. 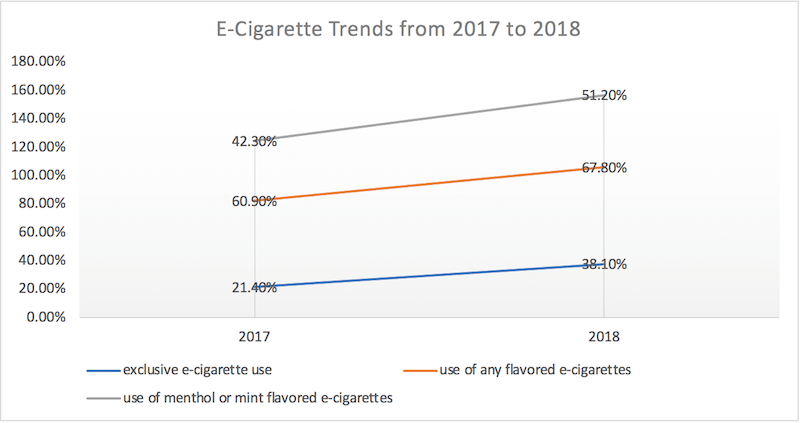 According to the Surgeon General’s report E-cigarette Use in Young Adults, e-cigarette use should now be considered a major public health concern, growing an astounding 900 percent among students from 2011 to 2015. E-cigarettes are considered the most commonly used delivery method for tobacco, and, by extension, nicotine, among young adults. However, most students who use e-cigarettes have never smoked traditional cigarettes and find the activity unappealing. The link between the rise in e-cigarette usage and the known negative effects of traditional smoking could be explained through the promise e-cigarettes carry and the cool factor associated with them. “There is an element of peer pressure, this notion of ‘it looks cool and all my friends are doing it’, and then enough people believe they are getting a smoke without the harmful effects,” McCaffrey said. Students like Barnard agree that e-cigarettes, especially JUUL with its sleek design making it look almost identical to a USB drive, make it popular and easy to take anywhere. Additionally, e-cigarettes have an added bonus that’s making them so attractive to young adults. Nicotine is more than a stimulant students take advantage of to complete school work; it is a relaxant, helping students when they feel anxious. However, with new research being conducted, researchers are discovering a growing number of negative side effects. “Firstly, using substances puts anyone at an increased risk for addictive habits, but also the few studies that have been done about e-cigarettes have found that people are also inhaling heavy metals, such as cadmium and lead, which can cause serious health effects,” McCaffrey said. When it comes to the students like Barnard, though, the benefits seem to outweigh the negative health risks. She believes that, while the studies are scary, and she wishes she had not put these chemicals in her lungs, the damage has already been done after almost three years of vaping. It is a growing sentiment echoed by an entire generation of highly-stressed students looking for a quick relief and a cause of apprehension for health officials. To combat the recent growing number of e-cigarette users, the FDA, in one of their largest coordinated efforts, issued over 1,300 warning letters and fines to third-party vendors in June to discourage sales to minors. The campaign included both brick-and-mortar stores and online retailers. One branch of their strategy is targeting the appealing factor of its stylish appearance to young adults. The FDA proposed a ban on some sweet e-cigarette flavorings in their Sept. 12 press release. Several of these flavors came from JUUL, including Mango or Cool Cucumber. While the studies done about e-cigarettes are fairly new, more studies showing negative side-effects in conjunction with the FDA’s push toward closer regulation on e-cigarettes are prompting students to take a harder look at their vaping habits are continuing to be published and with the FDA pushing forward with its efforts to regulate e-cigarettes more closely prompting students to take a look at their habit. She has cut down, not only on her usage but on her purchases of JUUL packs to curb her temptation to smoke. Barnard knows that her experimentation with her JUUL is now over and she still has two and a half more years to create the memories she actually wants.